So I was talking to my dad about the virtues of "old fashioned" shaving and he sprung a surprise on me. I was saying how I've been starting straight shaving with a Chinese Gold Dollar and he says "Oh, I have one of those. Hold on, I'll go get it..."
and then says "I won't use it, go ahead and take it." He said he bought it new sometime in the 50's when he was 18. The box says it's a Henckels "415" 5/8. He doesn't remember if its ever been honed but only stropped. So now I need to find someone who's willing to hone it to perfection. Congratulations on a great razor from a special person! That's great. It looks like a good razor, and it has special meaning. 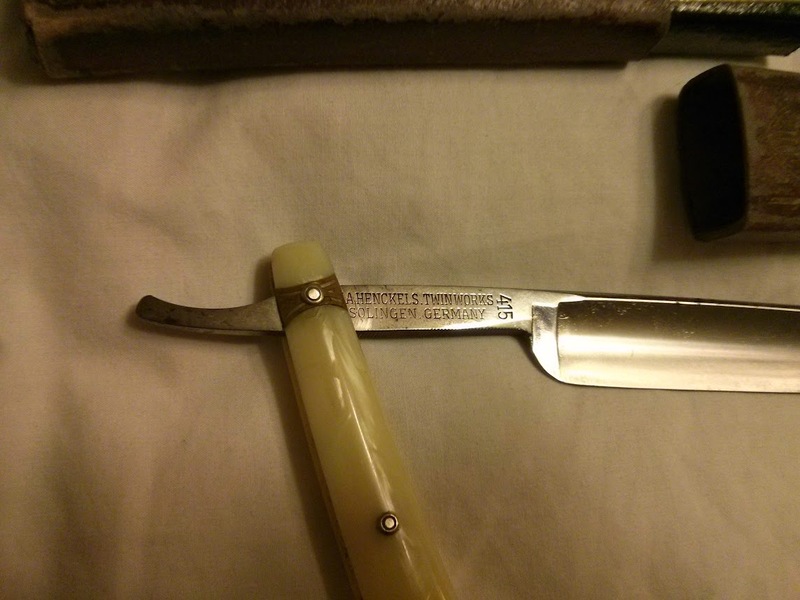 That is the coveted Henckels Twin Works razor, one of the great German blades of bygone years, and it looks to be in a good shape. From the photo, I guess the size at 4/8 or maybe a 5/8. The scales look good, too, and so does the strop. Now, have the razor honed and you're ready to go. Yes, the box shows the size as 5/8. It's a little smaller than my GD but the quality is vastly superior, and I won't be selling it since my father owned it from new. Once I get back to the UK, I need to find someone who can hone it since I have no equipment or knowledge to do it myself. A beautiful razor that you can pass on from generation to generation. Lovely razor my advice get the razor honed and use it. (05-03-2014, 12:27 PM)Mr_Smartepants Wrote: So I was talking to my dad about the virtues of "old fashioned" shaving and he sprung a surprise on me. I was saying how I've been starting straight shaving with a Chinese Gold Dollar and he says "Oh, I have one of those. Hold on, I'll go get it..."
Razor, box, and strop. What a score! I think it's great that he had this lovely razor and strop and was able to hand it down to you. It makes it that much more special. Very cool! And that's one pretty razor. I know the personal value of items like this , especially when it comes to razors as I have my Grandfathers 1907 Gillette.Which was then my fathers and he handed it off to me when I started shaving many years ago. Just wish he was a straight razor guy! Good for you! A beautiful razor with some meaning. Doesn't get much better! Congratulations!